This entry was posted in Uncategorized on September 23, 2008 by Huenemann. So who won/lost the debate? Was it silly or actually viable and interesting? I think it ended in a draw, which is how such things usually end. I didn’t think it was silly. As Huenemann put it at the end of the debate, hopefully theists left a little less comfortable with their view and atheists left a little less comfortable with their view. And hopefully both sides became more informed about the arguments on both sides, which might (maybe?) lead to a more civil debate. Great, I read some of the comments from the other posting and it sounded incredible interesting. 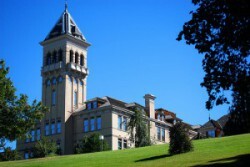 I miss being at usu (at times anyway)!